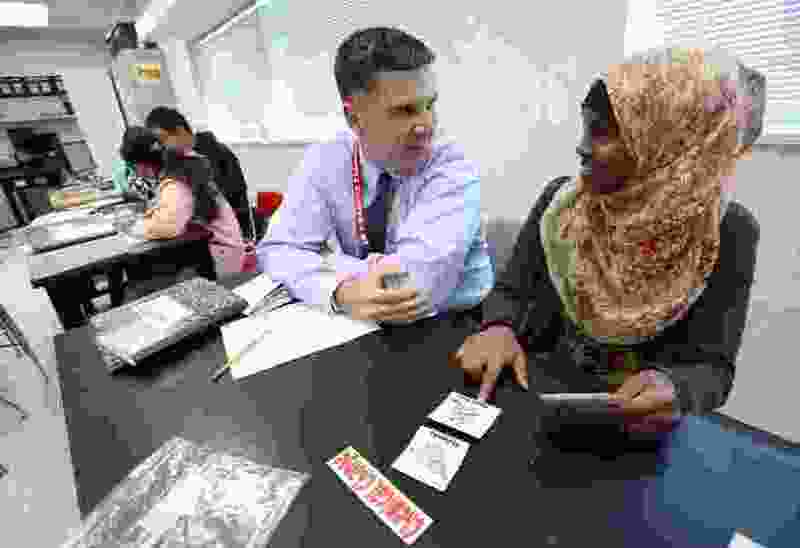 (Francisco Kjolseth | The Salt Lake Tribune) Northwest Middle School principal Brian Conley speaks with Fathi Mohamud, 13, at the school where 87% of the student body is of color. More than half of the new students who entered Utah’s public schools this year are minorities, according to data released Thursday by the Utah Board of Education. While those diversity numbers continue to steadily climb, the report showed a slowing growth rate overall for enrollment and a steeper trend at charter schools. The state added roughly 7,561 children in 2018 for a total of 659,909 students in Utah’s K-12 public education system. That’s 1.16 percent growth from last year, down from 1.18 in 2017 and 1.22 in 2016. "It's been a trend for several years now. It's not something to be overly concerned with,” said Mark Peterson, spokesman for the board of education. “And it gives some of the schools some breathing room." While growth is down slightly, Peterson said he’s glad to see that classrooms are increasingly becoming more diverse, particularly in a state that has long been dominantly white. Utah’s public schools, while still majority white, now have a population that is 26 percent students of color — a record for the state that will likely will continue to be broken each year. Of the nearly 7,500 new students in 2018, more than 4,600 are minorities, or roughly 61 percent. "Those are great numbers and it shows more diversity in our schools,” said Jeanetta Williams, president of the Salt Lake branch of the NAACP. Her group expressed concerns earlier this year about a perceived uptick in students using racial slurs or bullying based on race. Those issues will still be addressed, but the data, Williams said, “is proof that more families are feeling comfortable in Utah." The state now has 170,325 students of color, growing by more than 4,600 students this year and 4,000 in 2017. The largest body within the minority is students who identify as Hispanic, which make up roughly 17 percent of the public school population and added more than 3,000 students in 2018. At least three of Utah’s school districts have a majority population of minority students: San Juan School District is mostly Native American students, Ogden School District mostly Latino students and Salt Lake City School District with multiple minority groups accounting for more than half percent of those enrolled. Granite School District, Peterson added, is split about 50 percent white and 50 percent students of color. Statewide enrollment is not growing at the same clip. And Peterson said the places that are expanding are unevenly distributed. There tends to be more students crowding schools at the southern end of Salt Lake County and the northern end of Utah County. And charter schools, though outpacing the state’s growth rate as a whole, also saw less of a percentage increase in enrollment in 2018. The number of students at those campuses — which are publicly funded but operate independently of Utah’s 41 school districts — grew by 3.73 percent, of 2,817 students. That’s the lowest year-over-year increase for Utah charter schools in the past five years, down from 5.7 last year and 6 in 2016 and nearly 10 in 2015. The board of education annually compiles enrollment numbers each fall. Alpine School District in Utah County remained the state’s largest district with 80,218 students. It was followed by Davis, Granite and Jordan.